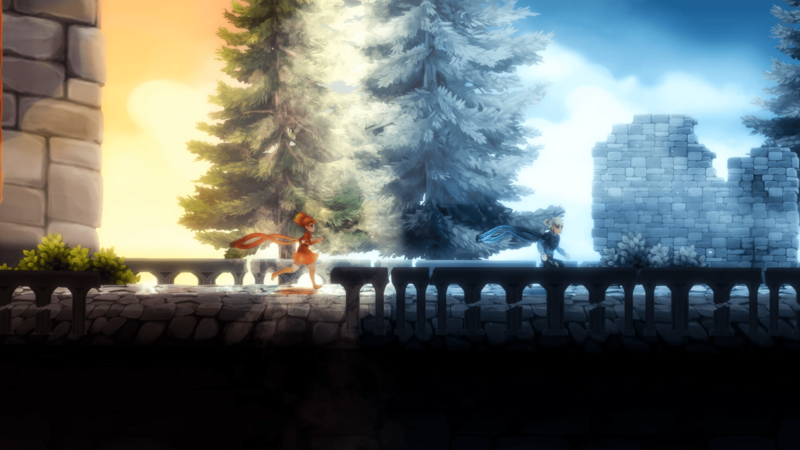 Degrees of Separation is a game that attempts to weave the tale of two characters, with different powers together, to tell an overarching story in a 2d puzzle platforming, fantasy adventure. That does some things extremely well. In Degrees of Separation, you are presented with two ways to play the game. Degrees of Separation can be played solo, or in local co-op mode. While the game is serviceable in single player, it is the co-op mode that is really how the game is designed to be played. In Degrees of Separation, you control Ember and Rime in solo mode or one of the two in co-op mode. The two characters have vastly different powers that must be used in correlation to solve the game’s environmental puzzles. Embers world is one of vibrant colors and fire, while Rimes world is cold and blue, gray, and white, filled with snow and ice. Each character’s world is represented in a beautiful fashion. The games main attraction is the absolutely gorgeous graphics and art style. When Ember and Rime’s worlds come together the games look is absolutely magical. The screen is split with each character on a side of the screen. When the characters move together, the two worlds meld in beautiful use of visual effects. I really can’t say enough about how gorgeous the game is. 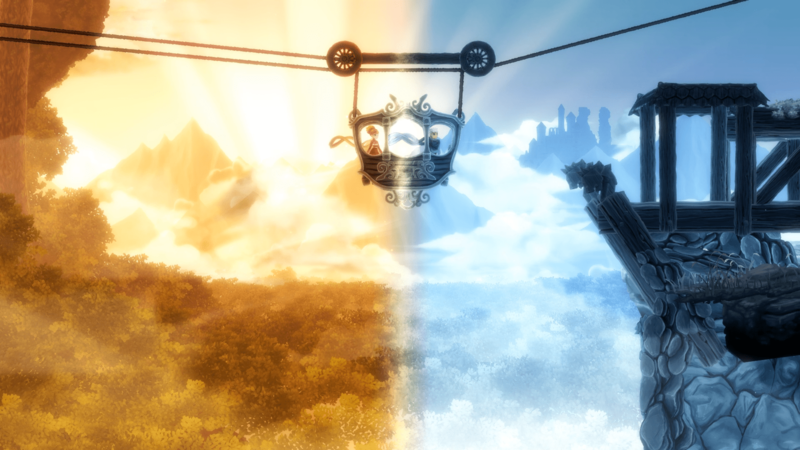 The gameplay in Degrees of Separation is a blend of your standard side-scrolling, puzzle platforming fare. The game is strictly puzzle based. There is really little that innovates on the gameplay front. The game does feature a few choppy animations, especially in the movement of the characters. The controls are solid. I never really found myself missing jumps through any fault of the gameplay. The puzzles are solid if not spectacular. None of them really stood out as particularly memorable. In my time playing through the game I began to feel as if the puzzles were becoming slightly similar. A bit more variety would go a long way. The games look, story and sound come together to create a truly relaxing, fun experience. The music and narration make you feel as though you are playing a fairy tale. The games ambiance is its greatest achievement. The story by Chris Avellone, writer of Pillars of Eternity and Into the Breach is cute, if slightly predictable. If you are looking for a break from fast-paced action, and want a relaxing experience, Degrees of Separation is a game you may well enjoy. The platforming is solid and I never encountered a rage inducing puzzle. Degrees of Separation is a game that is worth playing, especially at its price.